In a few days, I’ll officially be the Laurel clan chief—but it comes at a heavy cost. My human family, the McKyes, think I’m dead, and the only family I have left is my surly cousin, Theron. Plus the occasional visit from my dead mother. Gathering the fifteen clans of Atlantis is more tasking than I thought. Thank fate that Ian has my back, otherwise keeping the peace would be a total disaster. I want to give him my heart, too, but without an official likeness, or spontaneous pairing, it’s only wishful thinking. To make matters worse, someone out there has the formula to create human-Atlantian hybrids. For a hefty price. Certain chiefs are so desperate to increase our population that they refuse to see the price might be more than money; it could cost us our souls. 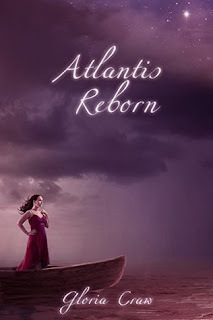 If I can’t change their minds, the descendants of Atlantis could disappear forever. The finale of the Atlantis Rising series brings Alison a meeting of the clan chiefs to take her seat as one of them. The lies and intrigue are only just beginning, and those odd little friends and alliances made in book two will become very important as new plots begin to unfold around them. Atlantians and humans were not meant to mix, and strange and horrible things can happen when they do. 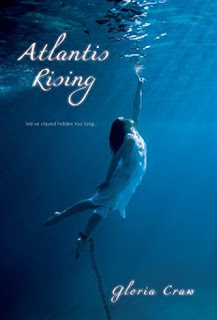 But they may be the only way to bring back the Atlantean race from the brink of extinction. There is a lot of political maneuvering in this one. And you need to pay close attention to all the little details, every word that people are saying, and everything they aren't saying. As Alison pulls apart the pieces of this new plot, with the help of friends old and new, we see a new dewing culture rising. I loved this ending, and felt that it was a great way to wrap up the series. After all they'd cost me, I thought I was done with the Truss clan. I was wrong. Nikki Dawning, my mortal enemy, has been kidnapped, and I've been asked to spy on the Truss to find her. The pull between Ian and I has never been stronger, but he can't help me this time. I have to rely on Theron, a bad-tempered cousin I didn't know I had. To make matters worse, the people I trust have been keeping secrets. I'm starting to feel like a weapon in a war I don't understand. How far am I willing to go to protect the descendants of Atlantis and the common good when I'm not sure what the common good is anymore? Only one thing is certain. If I'm the next Laurel clan chief, I can't let myself be manipulated…by anyone. The second book in the Atlantis Rising trilogy shows us a more confident Alison that had come to terms with her abilities and wants nothing to do with being used for anyone's political gain. But life has different plans when she is asked to go spy on the rival dewing clan to see what happened to another dewing that has disappeared. There are a lot of important little things that happen throughout the book. And there are several characters that don't seem to be such a big deal that turn into something vitally important by the end of the book and into book three. She also discovers more about her family and her clan from a new "friend," Theron. I really enjoyed Theron. His relationship with Alison wasn't what I had expected at all, and the way they interacted was a bit of a humorous moment at times as they were just both so stubborn and opinionated. 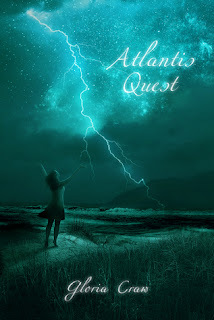 The events of Atlantis Quest leave lots of options open for book three, and I can't wait to see where Alison's life is going to take her next. The dewing society is changing, and whether that change is good or bad is not yet obvious. I am different. I have always been different, but no one can know or my life will be in danger. So I hide in plain sight, wearing drab clothes and thick glasses and trying to be invisible. I’m so good at hiding, no one has ever noticed me. Until Ian…the mysterious and oh-so-cute boy I know I need to avoid. The Atlantis Rising series was and quick series that caught me up right from the beginning - I just wanted to see more and more. Alison is different from the rest of the world. She has always felt it, but in the first part of the book we find out why she really is. As Alison discovers more about who and what she is, the reader is introduced to the concept of dewings. Magical beings that are each blessed with their own special skill. Alison's skill is one that is highly sought after and easily abused. Alison is introduced to the society and put under protection so the "bad guys" can't take her and force her to misuse her dewing ability. Along the way, she will have to choose between trying to lead a normal life and putting her "normal" family at risk or walk away to join her new dewing family and helping them bring the diverse and often combative dewing communities together. 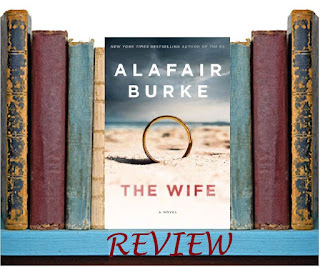 There are hints of romance, a lot of political-style intrigues, family drama, and heartache. It was an interesting story with a few slow moments. A lot of build up that sometimes let me down once we got to the end of it all. But there are two more books, and I can't wait to see where the drama is heading. 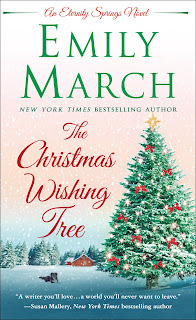 Sometimes life's most magical journeys bring you back to where it all began...From USA Today bestselling author Emily March comes The Christmas Wishing Tree, an enchanting account of the magic and miracle of Christmas. 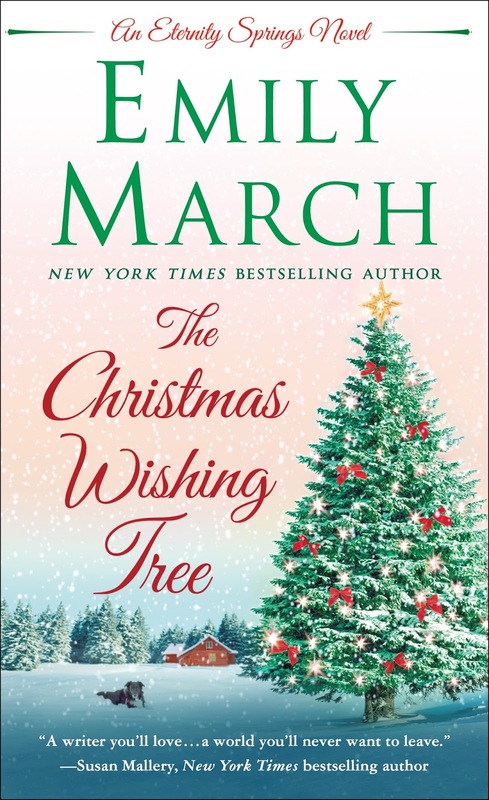 The Christmas Wishing Tree is a great romance. I fell in love with the town of Eternity Springs, Devin Murphy, and Celeste Blessings. When Celeste gives Devin a replacement cell phone for one that is broken, the story begins with a call from a little boy looking for Santa. This call is what takes Devin on a long and interesting trip to connecting with Devin's mother, Jenna. A connection that is in danger of being ripped away when she comes under attack from several deadly "pranks." The relationship was really great for me because it didn't happen overnight. Devin and Jenna circled each other for a long time before finally reconnecting on accident one summer in Eternity Springs. But Jenna is on the run, and Devin doesn't know if he wants to settle down. They are both adults thought, which was a great thing because there was no needless drama or arguing. The one thing I was disappointed in was the resolution to the deadly prankster. It is such a driving force throughout the whole book, and then it just goes away in the span of a couple pages. Yes, it is resolved, but I didn't feel like it was given the attention it really needed. Holy cow! The Wife was a mind-blowing story. I didn't see any of it coming, and I loved each and every little or big surprise. Angela has a dark past that she has never really recovered from, preferring to stay behind the scenes and not take part in the spotlight of her husband's amazingly successful career. But when women make accusations against him for sexual harassment, Angela sees her life starting to fall apart. But when these women disappear, Angela is forced even closer to the spotlight she has been trying to avoid. And here's where things get really really interesting. I had a least a dozen "say what?" moments that just led to yet another one. Nothing turned out the way I expected, but all made perfect sense in the end. There were some moments in the story that really dragged though. I'm still not sure if they were just lying more groundwork or just in there to take up a little space and spread out the story a little. I feel like if I read this book a second, third, fourth time, that I'd see more and more every time. That's how deep things are layered, and maybe there is more hidden in the dragging scenes than I gave them credit for. What she can’t remember could ruin her life. On the True World, Belinda Loring has known from childhood that she must Bond with the son of another noble First Family. Uniting the families ensures hers will hold onto its powerful position, and so she’s always pushed down the tender feelings she has for her best friend—gorgeous, steadfast Demian, who isn’t noble. But when the ceremonial magic goes disastrously wrong, Belinda becomes a national disgrace. Scorned as Broken, she turns to Demian for help getting revenge on the man who ruined her: the radical Malachi. 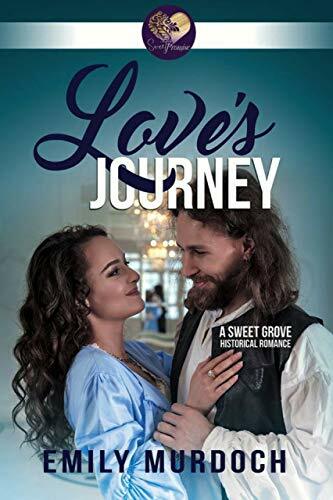 But the seeds of Malachi’s murderous plans lie buried in Belinda’s past, in the dark days of her kidnapping—a period of which she has no memory. And Demian may hold the key to recovering all that she’s lost—and saving the worlds. 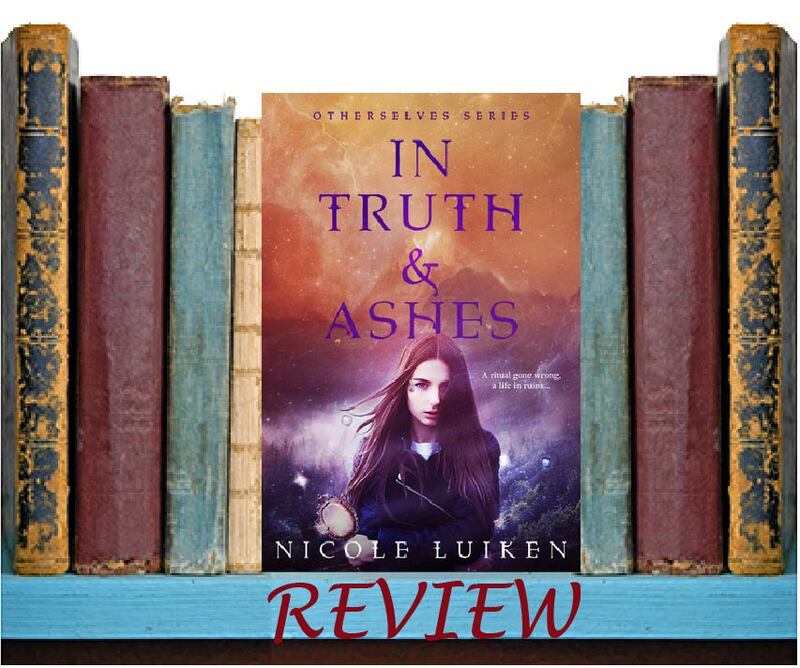 In Truth & Ashes was a bit different from the previous books in the Otherselves series. It really focuses on one world - the True World. The True World sits at the "center" of the Mirror Worlds and somewhat exerts control over them, playing matchmaker to ensure the True World selves have matching selves on the Mirror Worlds. It was all a bit creepy and really relegated that elemental worlds to nothing much more than a source of resources and prestige. Belinda is the center of our story and matching self for the characters in the Mirror Worlds. And at first, I hated her. I never really truly liked her, but she did earn my respect. 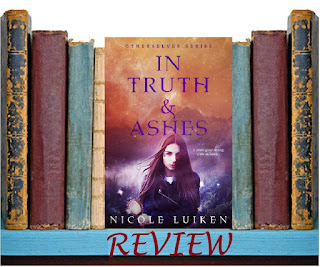 The final book in this series tries to draw all the cords together into one place, but that means I really missed seeing more of the Mirror Worlds that I had really loved. Fire is the only one that really manages to take center stage other than the True World. Things do come to some rather startling and unexpected conclusions. There is far more heart-pounding excitement in the final book than the others, and the way the day is saved was amazing. A few times we went over the top, but if you're going to go there, an explosive ending is the way to do it.